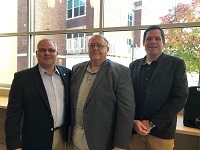 Yesterday, October 15th, North Central Missouri College’s National Government classes, taught by instructor Dr. Sterling Recker, hosted a District 7 Candidate Forum for incumbent Rusty Black (R) and challenger Dennis VanDyke (D) in Cross Hall Lobby on the North Central Missouri College campus. The forum was a question only format, with pre-screened questions submitted by students at NCMC. Pictured (left to right) is Representative Black, Dennis VanDyke, and Dr. Sterling Recker.